Nintendo's father of gaming hopes that the portly plumber will be adventuring in 3D before the year is out. Let's face it: A new Nintendo console never feels like a Nintendo console until there's a true Mario game on it. It's been true with every new piece of hardware from the NES to the Wii, and it's still true with the 3DS. Shigeru Miyamoto, however, hopes that the 3DS won't be Mario-less for long. 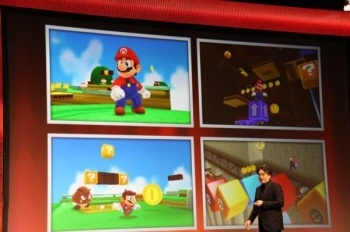 We know there is a new Super Mario in the works for the 3DS; even if Nintendo hadn't shown it off (in screenshot form) at the GDC presentation last March, it's a safe bet that somewhere at Nintendo, someone is always making a new Mario game. Beyond that, we don't know much about the title other than that it's being developed by Super Mario Galaxy studio Nintendo EAD Tokyo - which is good, because the Galaxy games were superb. Speaking with French gaming site Gameblog.fr, Nintendo's gaming guru Shigeru Miyamoto said that the hardware giant was hoping to deliver on Mario's latest adventure before the calendars change. "I promise to do all I can to deliver the new Mario game this year." The game is expected to make its formal debut at this year's E3 in June. Ten bucks says that it will also include Luigi, Bowser, and Princess Peach. Perhaps there will be cake.